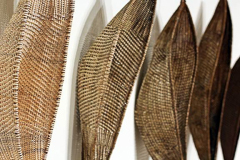 Using natural materials, metals, paper, alternative, and found materials, participants will explore the many possibilities of both basketry and sculptural shapes. 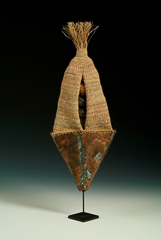 Twining, plaiting, coiling, knotting, and many other options for vessel forms will be explored. Students will have an opportunity to work in any scale they wish, even exploring the techniques and 3-D forms for jewelry size pieces. Metal work, embossing, enameling, and patinas will all be covered along with woven and cold connections. 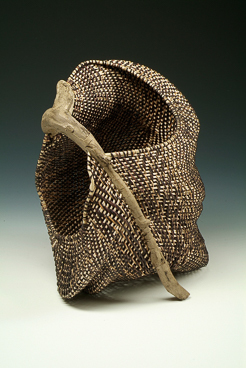 Weaving with natural materials, basketry reed and cane, and alternative materials will be encouraged. Mixing techniques in both metal and fiber and alternative surfaces will all be presented. This is a class of exploration between materials and 3-dimensional shapes. Basket weaving will be one of the ways that students can achieve shapes, vessels, and containers. Students are encouraged to bring images that inspire and ideas for shapes, color, and texture for interpretation for work. Carpet linen, cotton carpet thread, Irish waxed linen…. 6, 12, 4, ply or any other size students want to work in. Any strong fiber thread will work. Paper – any… more interesting the better. 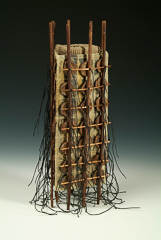 Found objects, items – larger items can be used as interesting bases or integrated into sculptural forms. Use your imagination and bring bits of fun stuff…..